Hello beauties. Previously I introduced you to my amazing October sponsors Ash B & Kalli. They are super sweet and kind, and I think you should go read about them in my post. 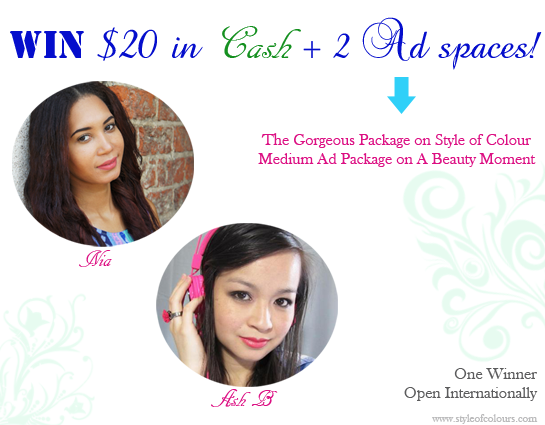 This month, we decided we will be giving away $20 Paypal Cash + 2 Ad Spaces! The Gorgeous Package on Style of Colours and a Medium Ad Package on A Beauty Moment. Doesn't that sound great? Whatever you would like to use the cash to do, it will entirely be up to you! This giveaway is open internationally to entrants 18 and over. All entries will be reviewed and a winner picked within 48 hours after the end of the giveaway. All entries from Spam or Giveaway only accounts will be disqualified. This giveaway is sponsored by A Beauty Moment & Style of Colours. This promotion is in no way sponsored, endorsed, administered by, or associated with Facebook/ Twitter and we hereby release Facebook/ Twitter of any liability. Tweets from protected accounts will not count as an entry. Really hope i win! kisses!